The Philadelphia Commission for Women held its 3rd Annual Summit for Women and Girls at La Salle University on Friday, March 15. The commission was created by an amendment to the Philadelphia Home Rule Charter, initiated by Councilwoman Blondell Reynolds Brown and passed by the voters in 2015. The commission is comprised of 10 people appointed by the mayor and 17 appointed by each member of City Council. Its missionsis to make recommendations that advance gender equality to the mayor, City Council and public policy makers. Organized around the theme, “Our Voices … Our Power,” the summit included sessions on health and wellness, financial literacy, self-esteem and leadership development. 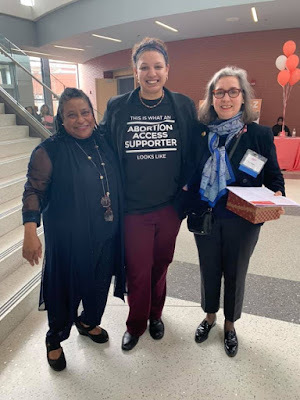 The first plenary session was well-received by a largely young and enthusiastic audience with speakers LaTosha Brown of the Black Voters Matter Fund, Gisele Baretto Fetterman, Pennsylvania’s Second Lady, and Rep. Elizabeth Fiedle of Pennsylvania’s 184th District. Fetterman’s description of growing up as an undocumented immigrant was particularly moving. She was told by her mother not to draw attention to herself, to be as invisible as possible – in sharp contrast to LaTosha Brown’s and Elizabeth Fiedler’s message to the young girls in the audience to raise their voices and aim high. A major theme of the conference was the shocking racial disparity in maternal and infant mortality, an issue that the Philadelphia Commission for Women has worked to bring to the attention of policy makers and the general public. In a breakout session, “The Reality of Maternal Mortality,” Rep. Morgan Cephas,(192nd District) said the state’s health care system was not meeting the needs of women of color, noting that the high proportion of African-American maternal and infant deaths cuts across socioeconomic lines. Philadelphia’s 8th District Councilperson Cindy Bass has introduced a resolution to hold hearings on this issue at Philadelphia City Council. In another breakout session, Feminista Jones, author of “Reclaiming Our Space: How Black Feminists are Changing the World from Tweets to the Streets,” also drew attention to racial disparities in infant and maternal deaths as one of the many reasons black women have every right to be angry. Despite persistent problems, however, many speakers also emphasized there was much to celebrate, with more women serving in elected office than ever before and, as the session “Never Too Young to Break Barriers” demonstrated, young women have become leaders in sports, education and community service. Rachel Donadio nails it. In a recent Atlantic article, she provides convincing evidence for Domenico’s involvement in the works attributed to Elena Ferrante but goes beyond identifying Starnone as co-author to explore questions about the nature of authorship and commonly held assumptions about gender and literature. When I first read Ferrante's novels, I was convinced they were written by a woman. 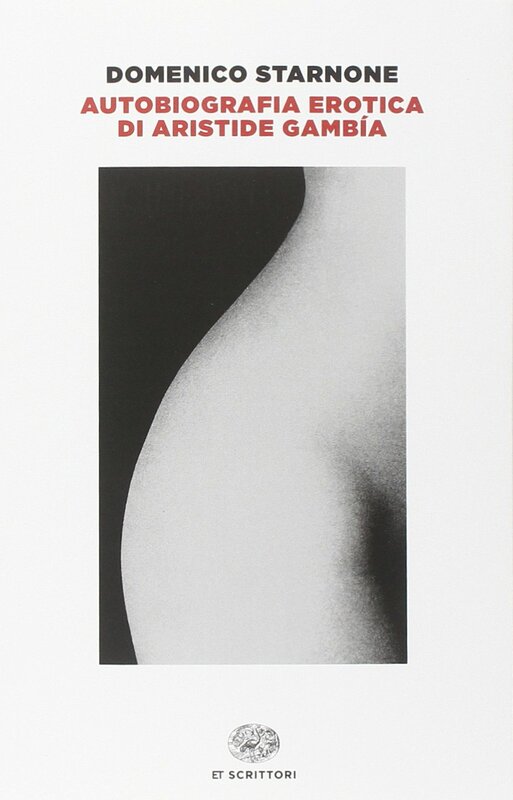 There were just too many intimate details of life in a female body. However, after Claudio Gatti’s well-documented revelation that Ferrante was Anita Raja, possibly working in collaboration with her husband Domenico Starnone, I could no longer ignore the mounting evidence that Starnone was involved in the creation of works attributed to Ferrante. Four groups of analysts using different text analysis programs independently came to the same conclusion that Starnone was in all likelihood the principal author of Ferrante’s novels. 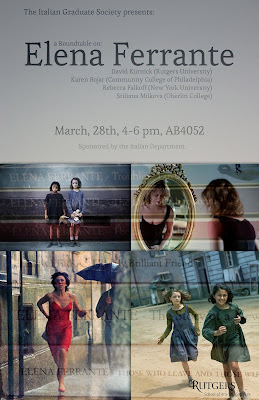 Furthermore, references to collaborative authorship abound in the Neapolitan Quartet and in Ferrante’s many interviews collected in Frantumaglia. When writing my book, In Search of Elena Ferrante, I turned to Starnone’s novels for further clues as to his contribution to Ferrante’s novels; however, unlike Donadio I was limited to those books translated into English. I found many stylistic and thematic similarities to Ferrante. First Execution ,like the Neapolitan novels, explores the ethical implications of political violence. Starnone’s Ties is strikingly similar to Ferrante’s The Days of Abandonment; both novels begin with a man abandoning his wife and children for a much younger woman, leaving his wife distraught, angry and unwilling to accept her husband’s betrayal. Starnone's Trick has thematic similarities to Ferrante’s Neapolitan novels. Like Elena Greco, Daniele Mallarico, the narrator of Trick, longed to escape Naples and his difficult family; like Elena, through education and talent he managed to do so. Several of the details of working class life recalled by Mallarico in Trick are reminiscent of descriptions of Elena’s family dealing with the difficulties of a large family living in a relatively small space. 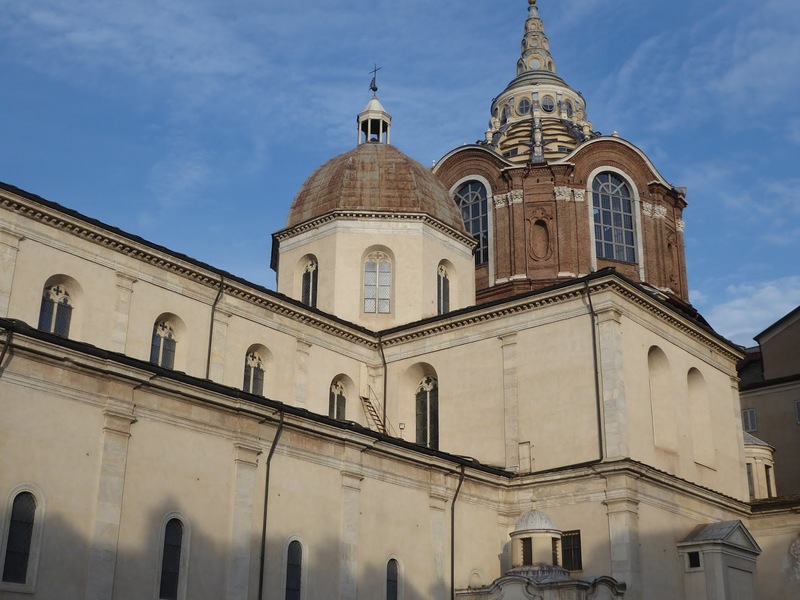 Elena at times speculates on what she might have become if she hadn’t had the strength to leave Naples, and what the far more talented Lila might have become if her family, like Elena’s, had allowed her to continue her education. Similarly, the elderly artist in Trick becomes obsessed with the roads not taken. These similarities between Starnone’s works and those attributed to Ferrante strengthened the case for his co-authorship. However, I believed that if I could read Starnone’s novels which had not been translated into English, I would have an even stronger case. Both in Autobiografia Erotica as in his novels Trick and Ties, Starnone leaves many clues about his relationship to the fictional Elena Ferrante. It certainly seems like he wants to be found out. The decision to publish under the pseudonym of Elena Ferrante was made over two decades ago, before Ferrante became an international sensation. 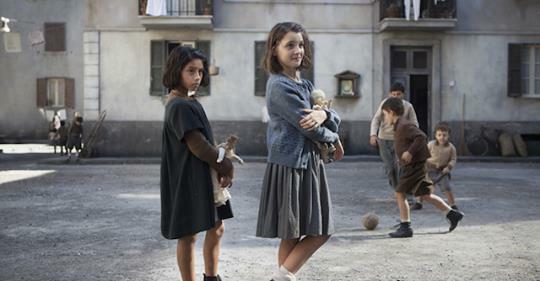 Could Starnone at this point in his life want recognition for his contribution towards the creation of the fictional character Elena Ferrante and her powerful novels? Starnone has apparently published fourteen works of fiction, eleven of which have not been translated into English, and which I would very much like to read. If Starnone were publicly identified as the co-author of the Neapolitan Quartet, I expect some of these books would be translated and made available to the English speaking reader. Milan was a surprise—both a pleasant and unpleasant surprise. We had visited Milan in the 1980s and I remembered it as a grimy city in desperate need of a clean up. Well, at some point between then and now the cleanup occurred and Milan sparkles. According to our hotel staff, the city got a makeover in 2015 when it hosted the World Expo. The cathedral is now gleaming white. Now for the unpleasant surprise. Milan is one of –perhaps the most--expensive cities we have visited. Although we regretted not spending more time in Turin and Genoa, were happy not to have done so in Milan. 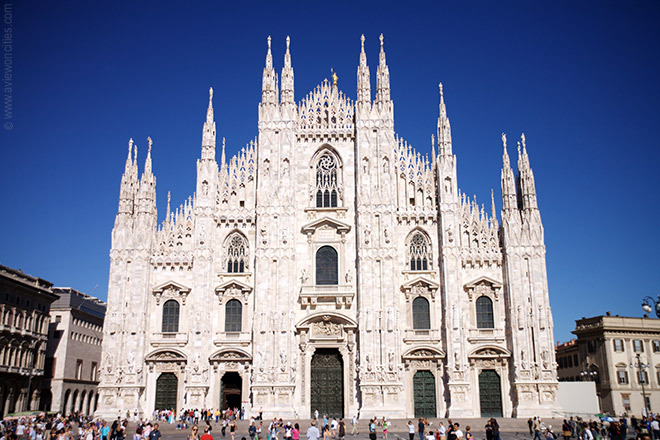 That said, I would advise any traveller to Northern Italy to spend a few days in Milan. The Brera Museum alone is worth one full day. 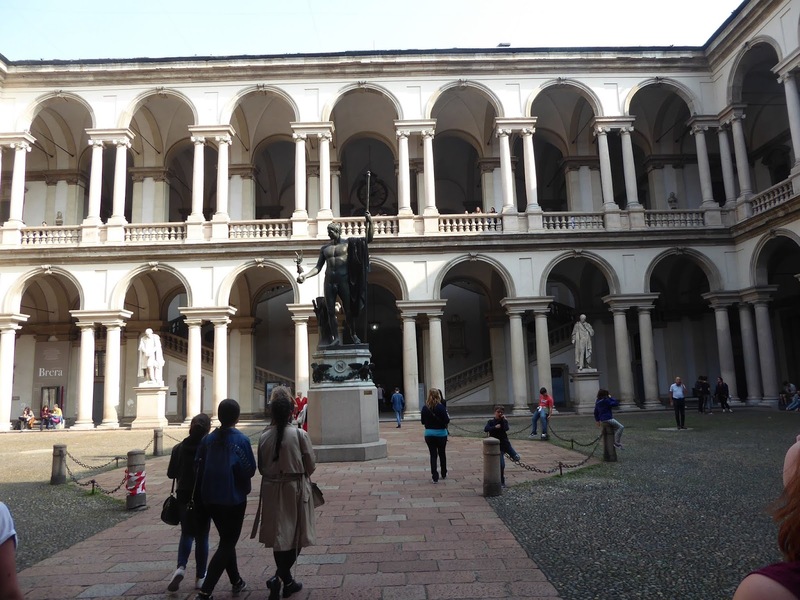 When we visited the Brera in 1980, we were astonished at how few people were there in this world class museum. We had its amazing collection almost to ourselves. Another highlight for me was my visit to the Milan Women's Bookstore- a must stop for any feminist visitor to Milan. Genoa like Turin is an open air architectural museum, but with a very different feel. 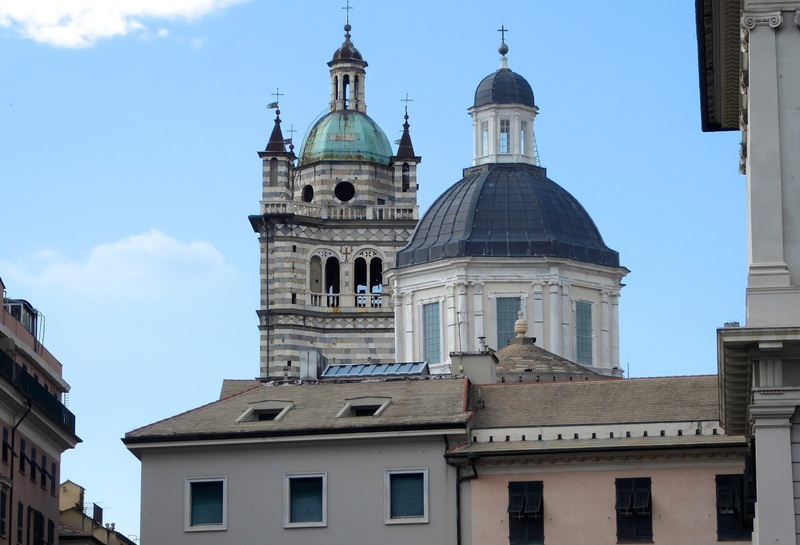 There is no French influence as in Turin; Genoa is very much an Italian city—in some ways reminiscent of Naples. 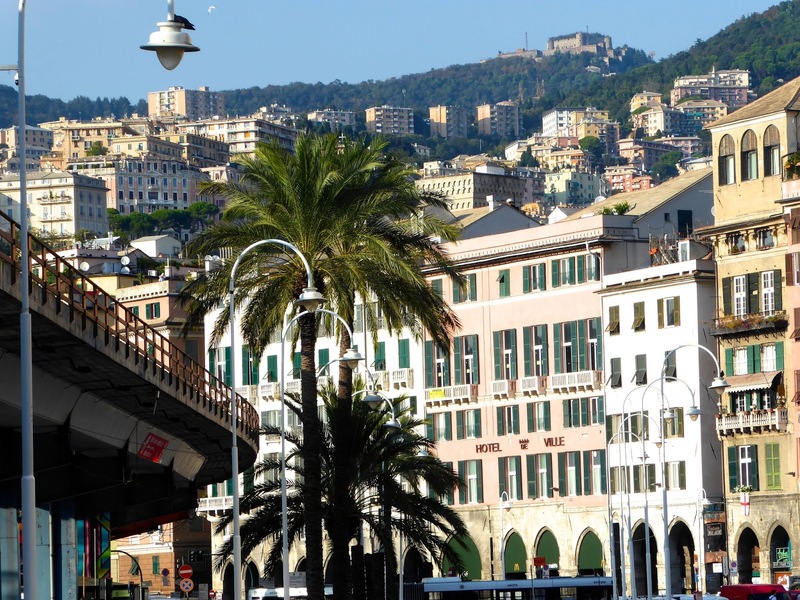 Both are port cities built on steep hills with a rich architectural heritage; however unlike Naples, in Genoa for the most part the baroque buildings are in good shape and the city is clean with very little trash and graffiti. Unfortunately, we both got sick for a few days—Rick with some kind of virus, me with what I think was food poisoning. However, we tried not to let it keep us from enjoying the city, but it did slow us down. Fortunately, the central historic district is very compact, with the spectacular squares, cathedral, museums all within easy walking distance. In Genoa we stayed in another NH collection hotel,NH Marina, and although it lacks the charm of the small boutique hotels we used to seek out, it had all the creature comforts we now require and the staff was wonderful. When I became violently ill, they came immediately to clean up the mess, change sheets etc. It came on quickly and passed quickly and was no doubt food poisoning. I’m now a bit wary of picturesque little trattorias in the historic districts of European cities and I will be much less likely to order shellfish in one of these charming little restaurants. 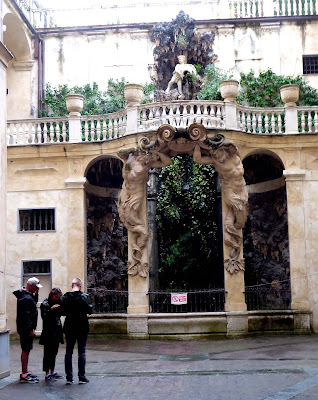 The food poisoning set us back and unfortunately, we didn’t make it to the Museo di Palazzo Reale, but on our last day in Genoa, despite the rain, we did manage to see the palazzos of the via Garibaldi, considered by Michelin to be the most beautiful street in Italy. I can see calling it the most architecturally impressive street in Italy, but for me beautiful for has to include greenery. On the Via Garibaldi, the greenery was all in the interior courtyards. 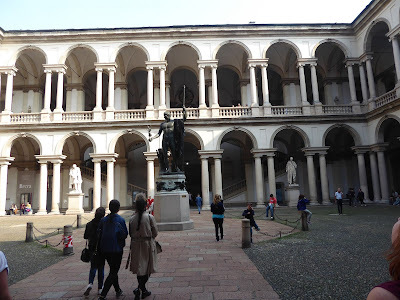 Also, two of the palazzos on the Via Garibaldi, Palazzo Rosso and Palazzo Blanco, have been turned into art museums—a consolation for not getting to the Museo di Palazzo Reale. 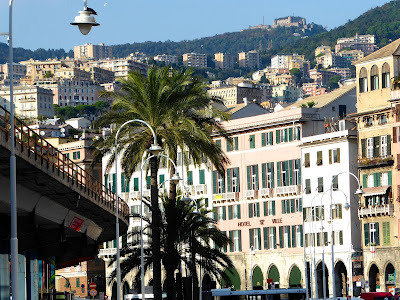 We had one truly magical day taking a train along the astonishingly beautiful Ligurian coast (the Italian Riviera). The Ligurian coast has been declared a UNESCO world heritage site—and for good reason. 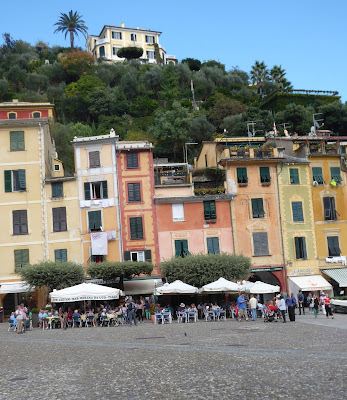 We stopped in the town of Portofino, once a sleepy fishing village, now a tourist mecca, but still charming. 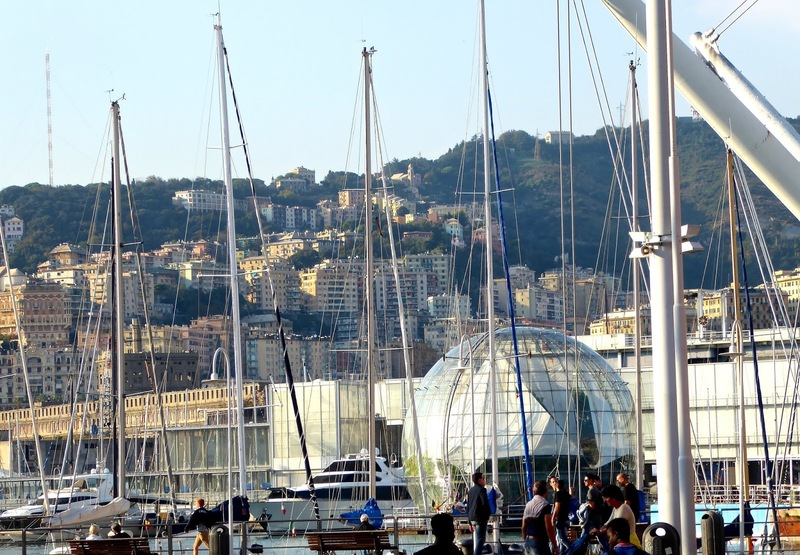 We’d also like to see Genoa again some day, but as with Turin, it’s not likely to happen. 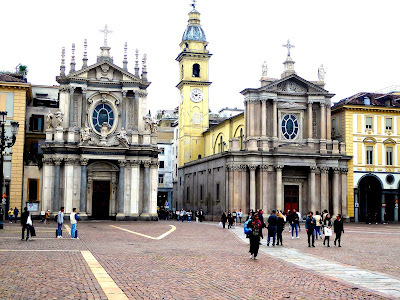 Turin was even better than I had expected—an open air architectural museum. However, we had one really frightening experience at the Hotel Carlina, part of a chain of hotels, the N-H collection. When we were younger, we searched for charming relatively low cost small hotels. An experience in Berlin in 2011 caused us to rethink our choice of hotels. We booked a suite at what was a highly recommended boutique hotel-- every bit as charming as advertised, but our room was a 6th floor walk-up and had no air-conditioning , no internet access, no laundry service. At that point we were down to our last clean clothes. The hotel staff suggested we lug our laundry to a laundromat—not exactly how we wanted to spend our few days in Berlin. We quickly found another hotel that lacked the charm but had an elevator, air-conditioning, internet access, and laundry service. Since then we’ve become wary of charming boutique hotels. We decided on one of N-H collection hotels in Turin because we knew we could count on a good bed, reliable elevator and internet access, a laundry service, a decent restaurant , bar and good breakfast. If we got sick, we’d have a pleasant place to hang out. If we needed help there would be staff who could provide it—in short everything elderly travelers need to be comfortable. 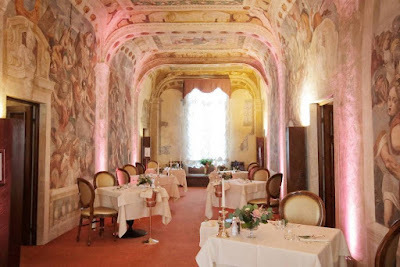 The NH-Carlina in Turin had all of the above and was housed in a former monastery. But no matter how well you plan, stuff happens. We were awakened in the middle of the night by a loud piercing siren and the message: “This is an emergency; you must evacuate immediately.” There was no indication what the problem was—very scary. The hotel guests were all outside—some who heeded the command to leave immediately were in their bathrobes. We managed to get dressed and grab our wallets and passports. In future hotel stays I will keep all medications together in one bag located near my pocketbook with wallet and passports. We learned the problem was a breakdown in the hot water system which had caused major flooding—not a bomb as many of us feared. The hotel staff told us the hotel would be closed and we had no idea when we would be allowed back in to get our belongings. The entrance to the stairs was blocked by armed firefighters, but I somehow managed to convince the one woman firefighter to let me get Rick’s medications and she accompanied me up the flooded staircase to get them. Finally after several hours we were allowed back into the hotel, told to pack quickly and leave the hotel as soon as possible; the hotel got us rooms in their sister hotel the San Stefano. We actually liked the less expensive, simpler San Stefano better than the Carlina with it’s gorgeous courtyard and rooftop terrace. The Carlina was a more impressive building, but the San Stefano had larger more comfortable rooms and I recommend it as a very good value. All’s well that ends well, but unfortunately the change of hotels cost some of our precious time in Turin, an open air architectural museum. More to come on the architectural riches of Turin. In January 2017, and again in 2018, millions of women worldwide poured into the streets of to protest the election of Donald Trump. The Women’s March belongs to all those grassroots women who marched for gender justice/racial justice and to the local organizers, who fundraised, secured permits, and planned the events. Their energy and commitment had much to do with the number of women who ran and won in the 2018 elections. Beginning as a Facebook post and driven largely by social media, the Women’s March demonstrated the power of social media to quickly mobilize large numbers of people. We are now seeing the limits of a social media driven mobilization. When conflicts arise, there exist no agreed upon mechanisms for resolving them and for holding leadership accountable. Although a non-profit Women’s March Inc. emerged from the initial march, it was not a membership organization with the power to set the agenda and elect board members and officers. Long smoldering conflicts in the organization broke out into the open in February 2018 when two of the co-chairs were prominent attendees at Nation of Islam leader Louis Farrakhan’s Saviours’ Day event. Many supporters of the Women’s March saw the relationship with a notorious misogynist, homophobe and anti-Semite as a disqualifier for leadership of a movement committed to gender justice and the elimination of all forms of bigotry and discrimination. Co-chair Tamika Mallory’s widely publicized praise of Farrakhan, as well as the failure to include Jewish women in the March’s unity principles, led to calls for the co-chairs to resign. The co-chairs responded to the outcry by including Jewish women in their unity principles, adding three Jewish women (including one trans and two black Jewish women) to their steering committee and by putting out a statement condemning anti-Semitism. For some, the statement rang hollow given Mallory’s continued refusal to disavow Farrakhan. Questions were also asked about the co-chairs’ management of the more than $2 million raised through contributions and sales of merchandise emblazoned with the Women’s March logo. Women’s March Inc. is currently trying to trademark the name Women’s March and is being sued by four local Women’s March organizations, which have argued that it can’t trademark a movement. Given these controversies, it’s no surprise that the 2019 march attracted far fewer participants than previous years and saw a dramatic drop in the number of sponsors as well as competing marches in several major cities. 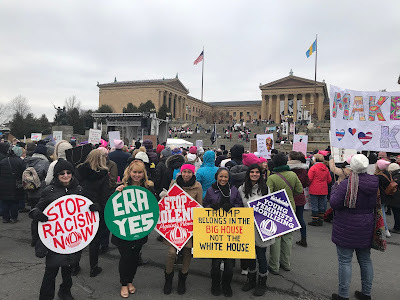 The conflicts on the national level played out in Philadelphia with two competing marches held at the same time: Philly Women Rally, which was unaffiliated with national Women’s March Inc. and Women’s March Pennsylvania, which was connected to the national Women’s March. Women’s March Pennsylvania, which rallied at Love Park, was considerably smaller with participants numbering in the hundreds. From all reports, however, the speeches were dynamic and the audience was energized. Among the speakers were city council candidates Sherrie Cohen and Melissa Robbins, Yaya Rivera of the Northwest Indivisible Reproductive Justice Working Group and Nina Ahmad, former Deputy Mayor for Public Engagement and candidate for Pennsylvania Lieutenant Governor. According to Lynne Jacobs, President of the Philadelphia Council of Jewish Women, the Philadelphia Council followed the recommendation of their national organization to support local marches not affiliated with the national Women’s March Inc., and thus supported Philly Women Rally. Philadelphia NOW decided to encourage its members to participate, but declined to endorse either march. “Some members chose to go to one over the other, but most of us decided we should attend parts of both to support all women,” said NOW President Krishna Rami. It was a difficult decision for many feminist groups and for individual women trying to decide which march to attend or even if they should attend at all. I heard variations on Brown’s comment from quite a few participants who also noted the number of young women involved and insisted that the march belonged to the grassroots women who built local and regional marches across the country. Only time will tell how the current conflict in the women’s movement will play out. While concerned about the conflicts, Mt. Airy social justice activist Antje Mattheus said that some conflict should be expected in building that movement. “We are setting ourselves up for failure if we assume that we can reproduce the success – in terms of attendance and broad alliances – of the 2017 worldwide Women’s March and call it a movement,” she said. “A march is an action. In 2017 it was a very large action, but a march is not a movement. I usually post our travel notes right after a trip. 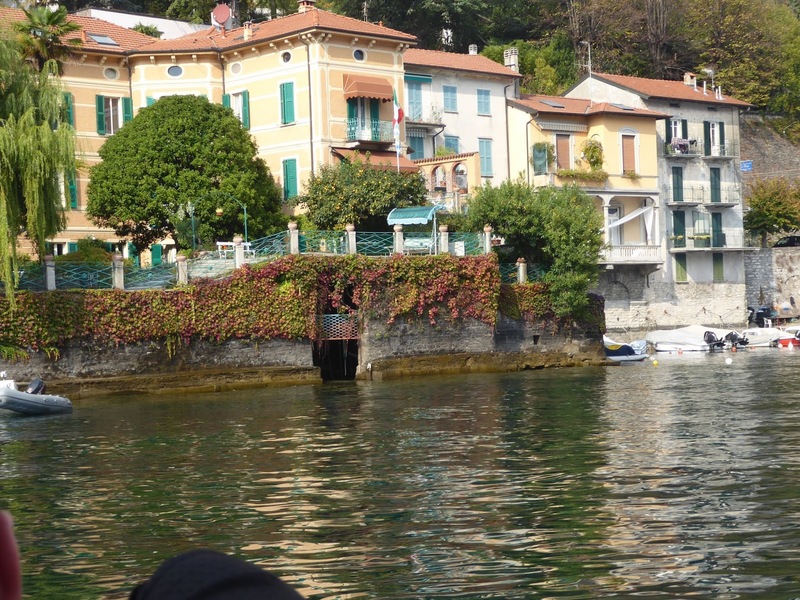 This last trip we returned to fall clean up, election work, and publicity for my book In Search of Elena Ferrante. The travel notes got lost in the shuffle. Fading memories are a downside of posting months after a vacation. What remains are a few highlights—the best and the worst of the trip. Travel is getting harder, for sure. It’s much more difficult to get an upgrade. So-called premium seats in economy were uncomfortable; I can’t imagine how bad the non-premium seats must be. Last year we flew SAS to Scandinavia. The premium economy seats were so good, we didn’t feel any need for an upgrade. We thought about going to Denmark this year—in part for the pleasures of SAS—but the lure of Italy was too powerful. We have never been to Northwestern Italy, so we decided it was time to see this region, while we're still capable of international travel. Since there are no longer direct flights from Philly to Milan, we flew into Venice, but since we’ve already been to Venice four times we decided to pass on going into the city. Getting in and out of Venice is not easy and with more and more cruise ships stopping in Venice, the crowds are unbearable. 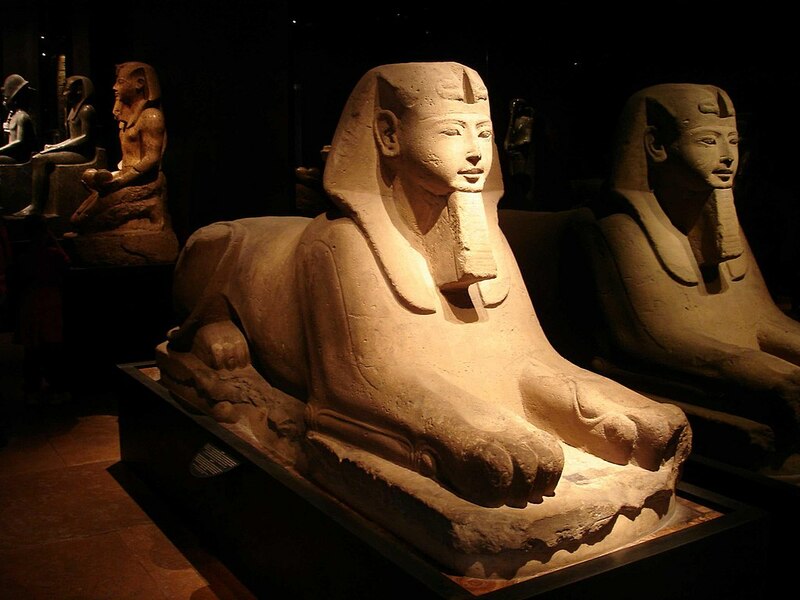 There’s not a whole lot to do in Mestre but we weren’t up to doing much more than unwind. 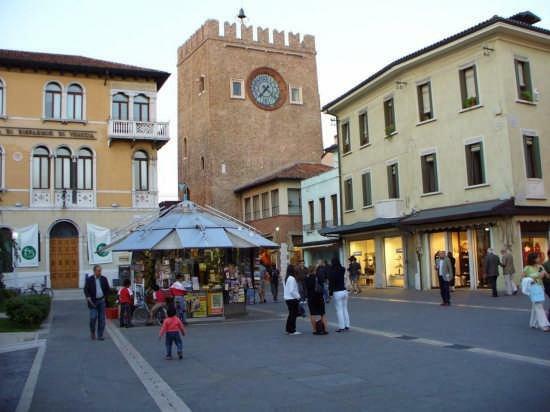 However, there is a beautiful town square—evidence that Mestre was once a wealthy town. 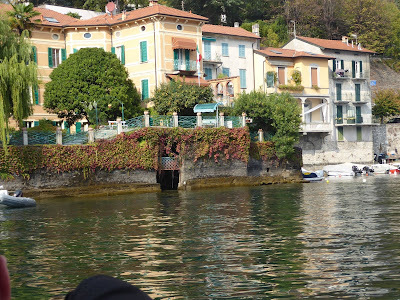 We hung out there for a few hours sipping (in my case) Campari, (in Rick’s) Fernet Branca. The next day we dealt with the challenges of train travel. If the elevators are working, it’s manageable. If they’re not--and this time the elevator to the platform was not--it was a struggle. Fortunately there was someone who could help us. One of the great pleasures of traveling in Italy is the Italian people who are almost without exception kind and helpful, especially to old folks. At this stage in life getting our luggage into the overhead bin is impossible and unlike planes, there are no attendants to help. Our way of dealing with this is to always get business class—it doesn’t cost that much more than economy—and get there early so we can put our luggage in the small space allotted for luggage that doesn’t fit into the bins. Granted if we could only learn to travel super light, this would be less of a problem. Aside from the luggage problem, I like train travel. The train from Mestre to Turin isn’t a scenic spectacular, but there were some glimpses of Lake Garda and the seats are so much more comfortable than those ever shrinking economy class airline seats. Episode 4 is certainly the dramatic high point of the series to date with two of the most compelling scenes—the dance party and the New Year’s Eve party. When I first read My Brilliant Friend, I remember thinking that if the novel were ever adapted for film, these two (along with the wedding scene) would be key scenes; they seemed written for adaptation as a screenplay. 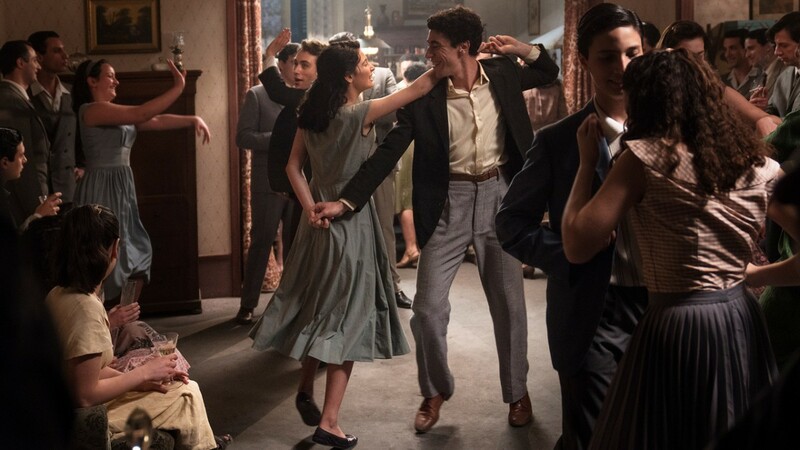 The dance party at Gigliola’s house showcases Lila’s transformation into a beautiful, sexually alluring teenager with all the young men from the neighborhood vying for her attention. Lila has developed a passion for dancing which, like everything else she undertakes, she does extremely well. Elena watches glumly on the sidelines, realizing that Lila has far surpassed her in beauty and sexual attractiveness as she has surpassed her in intelligence and academic performance. 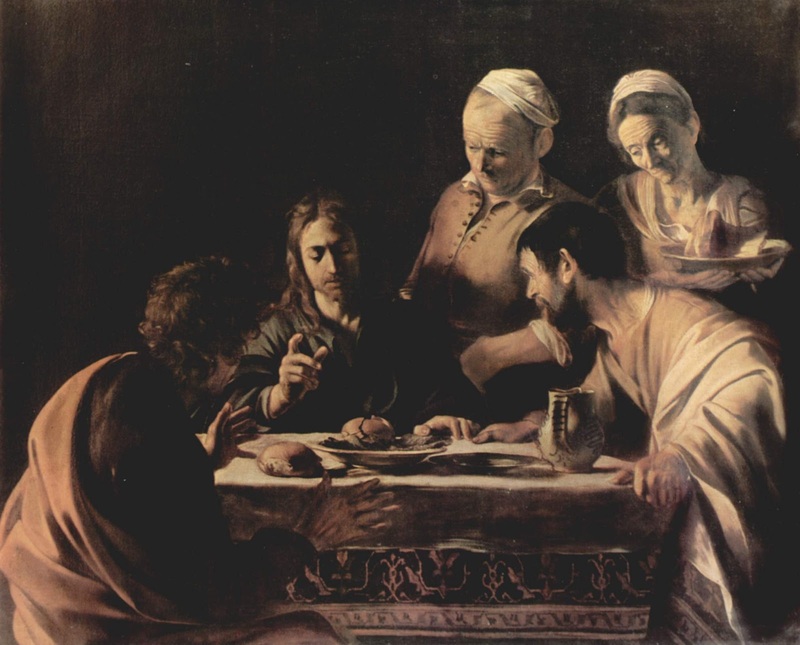 The party ends on a sour note as the Solaras demand that Gigliola’s mother ask Pasquale to leave ostensibly because his father was accused of murdering the father of other guests, the Carracci family, but more likely because Marcello Solara perceived Pasquale as a rival for Lila’s attention. The Solaras are trying to stoke the tensions/ old hostilities in the neighborhood, just as Stefano Carracci surprises everyone by rejecting the revenge ethic so deeply ingrained in the culture of the neighborhood and inviting the Pelusos to his New Year’s Eve party. 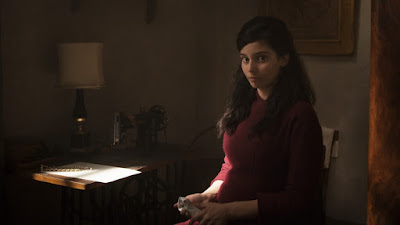 Stefano grew up in a world where insults must be avenged; in the first episode we see a teenage Stefano assaulting Lila for besting his brother Alfonso in a scholastic competition. Given his background, Stefano’s transformation is remarkable. Reluctantly Pasquale agrees to accept Stefano’s invitation and on New Year’s Eve the old enemies gathered at the house of the Caracci family to celebrate the New Year together, with Stefano being especially kind to Signora Peluso, first filling his mother’s glass with spumante and then the glass of Signora Peluso. One ancient quarrel was resolved but another was burning brightly. The young men of the neighborhood engaged in their New Year’s Eve battle, armed with firecrackers and explosives. The Caraccis and their former enemies, the Pelusos, were on one side and the Solaras and their allies on the other. The scene is beautifully choreographed ending when the brutal Solaras, angry at being out done by the Caraccis and their new allies, started firing real bullets. Lila’s response to the episode reveals the emotional fragility that coexists with the steely resolve she so often displays. She appears to have a kind of mental breakdown—what she refers to as “dissolving margins.” The extreme anxiety appears to be connected to her worry about her brother who has become obsessed with the goal of becoming rich. 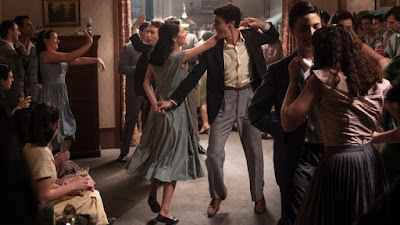 Ferrante has done a brilliant job interweaving the political history with the characters’ personal lives and Costanzo has managed to do this as well in the film-- a medium that lends itself less easily to this integration of personal stories with the historical drama.